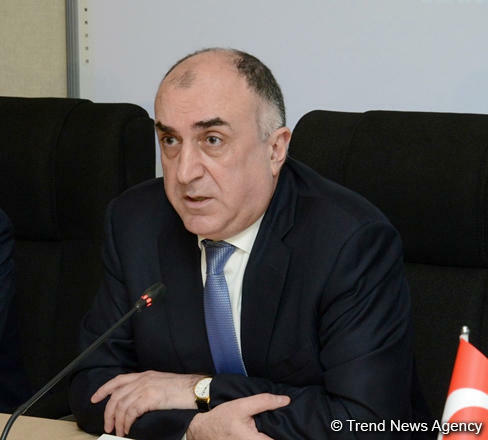 Baku hopes for progress in 2019 in terms of withdrawal of Armenian armed forces from Azerbaijan’s occupied territories, Azerbaijan’s Foreign Minister Elmar Mammadyarov said in an interview with The Korea Times, Trend reports. Mammadyarov noted that unfortunately, negotiations held over the years haven't yielded any results. “But the recent developments taking place in Armenia, the conversations that took place between the President of the Republic of Azerbaijan and the Prime Minister of the Republic of Armenia, as well as four meetings with my Armenian counterpart create certain grounds for advancing the negotiation process. The press statement by the OSCE Minsk Group co-chairs released on the latest meeting of the Foreign Ministers of Azerbaijan and Armenia in Paris on Jan. 16, 2019 expressed appreciation for the ongoing efforts of the sides to maintain an environment conducive to intensive results-oriented negotiations. It stated the agreement of both sides upon the necessity of taking concrete measures to prepare the populations for peace. The statement also outlines that the sides considered next steps toward a possible summit between the leaders of Azerbaijan and Armenia in order to give a strong impulse to the dynamic of negotiations,” said the foreign minister. He pointed out that Azerbaijan stands for tangible results of the negotiations, not talks for the sake of talks and this is the country’s principled position. “In general, I would like to note that the current leadership of Armenia should demonstrate the political will to resolve the conflict and, in accordance with good-neighborly philosophy, act in the name of achieving peace, stability and sustainable development in the region. We hope that this year certain progress will be achieved in terms of withdrawal of the Armenian armed forces from the occupied territories of Azerbaijan and the normalization of relations between the two countries. Progress in the conflict resolution, creating conditions for peace, security and stability in the entire region, opens up opportunities primarily for economic growth in Armenia itself,” said Mammadyarov. The foreign minister noted that Azerbaijan, in the same way as it ensures the safety of its citizens of different ethnic groups, in accordance with its international obligations is ready to do so with respect to its citizens of the Armenian origin in Nagorno-Karabakh and to grant them the right of high-level self-rule within the internationally recognized borders of the Republic of Azerbaijan. “The Azerbaijani Community of the Nagorno-Karabakh region of our country is ready to return to their homes, and this issue was again stressed in the recently released statement of the Community. Some time ago there were contacts between the Azerbaijani and Armenian communities of the Nagorno-Karabakh region, but, unfortunately, due to the "efforts" of the previous leadership of Armenia, these contacts were interrupted. You know, it is impossible to take the land and move with it to another place. After the settlement of the conflict, of course, these two communities will have to live together. That is why it is important to promote and restore contacts between the Azerbaijani and Armenian communities of Nagorno-Karabakh,” he concluded.